Many of us have been there—we’ve cooked rice to what we think is the perfect timing, only to find it burned and stuck to the bottom of the pot. To sidestep future rice crises, check out our Rice Cooking Chart. While you’re there, scroll down the page for a delicious Basmati Rice Salad recipe.A cooking tip: Make sure that the lid fits tightly on the pot. Steam that escapes will use up the heat needed to cook the rice, and potentially cause burned rice as you try to get it to the desired tenderness after all the water has evaporated. Another tip: Buy yourself a rice cooker; or if you don’t have space for a pot dedicated to rice, get a multipurpose pot that is great for rice. Kohl’s has a new line of hard-anodized aluminum cookware, developed in partnership with The Food Network, that heats evenly to avoid overcooking and burning. A beautiful, effective and affordable new cookware from Kohl’s and the Food Network. The pots and pans are lined with DuPont professional nonstick coating, which is metal-utensil safe and easy to clean. Tight-fitting tempered glass lids allow constant monitoring of the works-in-progress, without heat loss. Rice will never burn again! We’re clearing out our user-unfriendly pots and pans and getting a set of these. 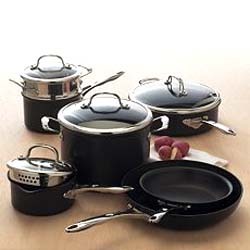 You can buy them online at Kohls.com (the 11 pieces shown in the photo are $299.99, but you can buy just the 1-quart Covered Saucepan, shown at the rear with the built-in strainer, for $39.99). While you’re there, take a look at all of the other nifty items in the new Food Network line. We want so many pieces, we needed a second page for our list. If you like the idea of healthy pumpkin seeds but not the shells or the excessive saltiness, imagine gourmet pumpkin seeds. 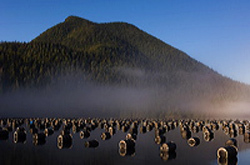 Four years ago, Kathie Rosenschein began making SuperSeedz as a healthy snack for her family. Encouraged by all, she then started to sell them at craft fairs. This year, she has a Gold Medal Winner from the Gallo Family Winery for her artisan food craftsman ship and is a NIBBLE Top Pick. The delicious, all natural pumpkin seeds come in four flavors: Sea Salt, Original Curry, Somewhat Spicy and Cinnamon & Sugar. They’re great to eat straight from the bag but we use them to accent foods ranging from eggs to salads to yogurt. They surely supercede (pun intended) any other roasted pumpkin seeds out there. Read the full review of Superseedz. 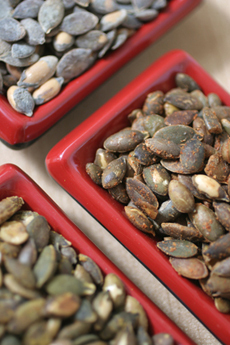 PHOTO: SuperSeedz pumpkin seeds, for snacking and gifting (photo by Naheed Choudry |THE NIBBLE). When you buy these “nibble for the cure” bonbons from Chocolat Céleste, producer of delicious ganache-filled bonbons, 15% of the purchase price is donated to the Breast Cancer Awareness Association, a charity where more than 90% of funds donated go directly toward providing breast cancer education and support. Plus, research suggests that eating dark chocolate can help fight cancer; so nibbling on these is doubly guilt-free. 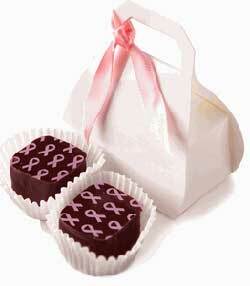 A 2-piece favor box is $8.00, 4-piece box $16, 9-piece box $36.00; all are hand-tied with pink satin ribbon. 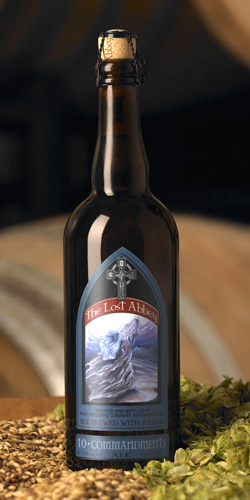 The special design is available through November 15; thereafter, by special order for events. Read our full review of Chocolat Céleste.